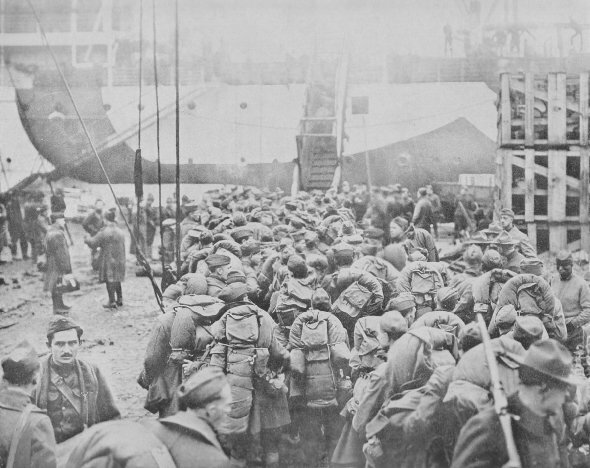 "PACK UP YOUR TROUBLES IN YOUR OLD KIT BAG, AND SMILE, SMILE, SMILE"
Before the close of the eventful year of 1918, the first contingents of America's 2,000,000 troops in France were boarding ships for the U. S. There is no singing as the men embark at St. Nazaire. Smiles are forced. They march silently, thinking of those who are not coming back.